Hitman 5 in development | God is a Geek: Video Game Reviews, Previews, Videos, Podcasts, and More. Operation Flashpoint?! More like Operation Strangest Special Edition! He's Baaaaaaack.....well we think so anyway! 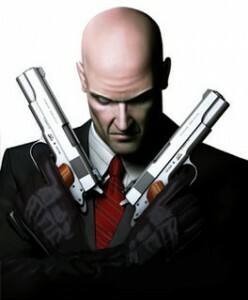 It seems like Agent 47 is on his way back after a long deserved break. How do we know? Well the news has been “leaked” from a rather unusual source. The online resume of actor Mark Sloan states that last year he did some motion capture work for Hitman 5 at Rocksteady Limited. Now as some of you might know the Hitman games have previously been developed by IO Interactive so this “leak” also suggests that the game will have a new development team at the helm. Rocksteady have recently come into the gaming limelight as the development team working on the much anticipated upcoming Batman: Arkham Asylum. They are also well known as the creative minds behind Urban Chaos: Riot Response, a pretty decent FPS which was released back in 2006. Both these games have one thing in common, the publisher is Eidos; the company that owns the rights to the Hitman games. Eidos also partially own Rocksteady so if you put two and two together you get four but hey that’s beside the point, I think it is safe to say this “leak” will probably turn out to be correct (don’t hurt us if it doesn’t though!). Although IO Interactive did a great job with the previous Hitman game (Blood Money) they are currently busy working on a few titles, one of them being a sequel to (*shudders*) Kane and Lynch. After getting hands-on with Batman: Arkham Asylum and playing the much overlooked Urban Chaos: Riot Response, I think the future of Agent 47 is in good hands and I look forward to what Rocksteady can bring to the table.